Lot 1132 & 1133, No. 1, Jalan Perindustrian SIS 1, Taman Perindustrian SIS 228, 43700 Beranang, Selangor, Malaysia. 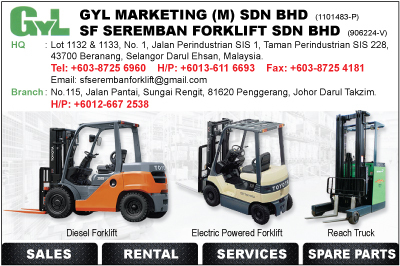 SF Seremban Forkilift Providing clean, safe, and high-quality products and services. For more than 10 years of experience, we have been dedicated to giving form to the superior material handling solutions that fulfill your expectation.